We and others have shown unique structural and functional similarities of central nervous system (CNS) cells and peripheral blood immune cells. Hence, studies of various immune cells in peripheral blood make possible longitudinal studies of patients with CNS disorders, especially of the effects of therapy, without requiring serial brain biopsies. Using this approach in Alzheimer’s disease (AD), we found aberrations of both cellular immunity and humoral immunity. 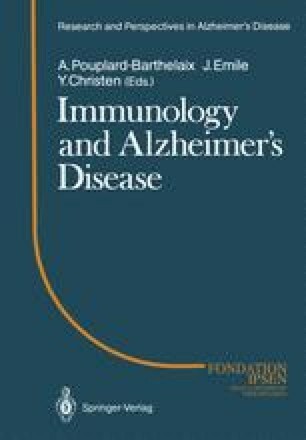 Depending upon the nature of the immune deficits and patients’ responsiveness to appropriate immunomodulant therapy, we have thus far distinguished four subsets of AD patients: one subset with defect (membrane fluidity) of a specific T cell and who respond to pyrrolidone therapy; a second subset with serum antibodies to neuron-axon filament proteins — these patients improve clinically after therapy with dialyzable leucocyte extract (DLE); a third subset with antibodies to brain antigens (autoimmune) for whom therapy has not yet been developed; and a fourth subset with none of the abnormalities mentioned above, probably heterogeneous due to multiple biochemical deficiencies. We believe that different therapeutic modalities will be necessary for different subsets, much like the situation with other “diseases” such as anemia and diabetes. These results provide additional evidence that AD is a syndrome, not a single disease. Additionally, the clinical improvement demonstrated that the defective function in AD is not due to the relevant neuronal cells being dead, but because they are either atrophied or their function is suppressed.